Thread:  We're Planting a Tree for Every Backer! I'm sure it comes to no surprise to many of you that Earth Day has important significance for us at PixelCount Studios. The world we're crafting in Kynseed is a lush paradise whose inhabitants have a deep respect for nature. As we build that world, many of its trees are uniquely made and painstakingly assembled. Every patch of grass and cluster of flowers is hand-placed. At the very heart of the game, its most core feature centers around the planting of an acorn that grows into your family tree. As you play the game, the paths you choose in life will manifest in its branches, serving as a reflection of yourself and of your family's lineage. Over the course of the game, the roots of this tree will grow ever deeper. Here in the real world, it's a bit harder to plop down a forest of trees with a few clicks. Yet there are areas of deforestation on this planet where something like that is sorely needed. So we are absolutely thrilled to announce that PixelCount Studios has partnered with a reforestation project to plant a real world tree for every single individual Kynseed backer! It's fairly common knowledge that trees are pretty handy to have around. If we wanted to I'm sure we could be cliche and give you a buncha statistics all about how the planet needs more trees. We could...and we will! Sneak statistics attack! The destruction of a healthy forest system can create a cascade of problems. Trees help provide a habitat for animals, purify water systems, help control flooding or erosion, and help replenish the soil with nutrients. In Madagascar, only 10% of its original forests remain today. In Haiti, a mere 2% of its land is forested. In Nepal, 70% of its population is forest dependent and yet less than 30% of its forests remain. The thing is, we're not a big company with big resources - evident by the fact that our game began on Kickstarter. But as a ragtag band of indie developers, we've always been starry-eyed at the thought of our games helping serve some bigger purpose. The idea of donating a tree on behalf of every Kynseed backer is something we've wanted to do since the start of the project. However, we also knew that there was no way we'd have the resources to do that sorta thing on our own. So we began looking around for someone who could help us pull it off. That journey led us to finding Eden Reforestation Projects - a nonprofit organization that works directly with villages and communities suffering from extreme poverty resulting from the destruction and deforestation of land. They've been doing this for 14 years and in that time they've helped plant millions of trees. 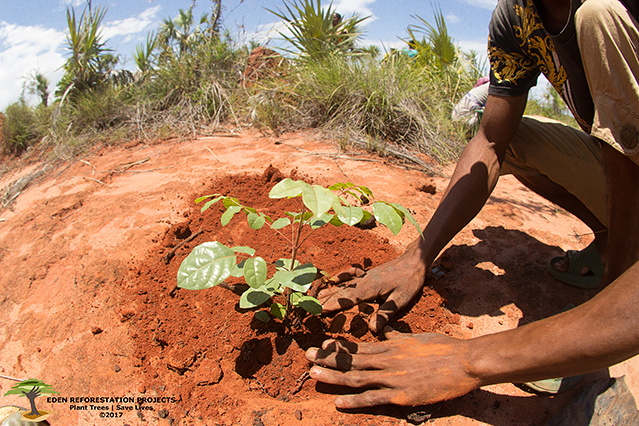 In fact, mere days ago, they just reached 200,000,000 trees planted! Their headquarters are based in Glendora, California, which is just a hop, skip, and jump away for Los Angeles based PixelCount developer Matt. He has been working with them in what little spare time he has and we are now happy to report that we've partnered with Eden to plant literally thousands of trees on behalf of all you amazing Kynseed backers. We're not big fans of business babble and we try to avoid it at all costs. So rather than be secretive about what this is costing us, we figured we'd just straight up tell you. Eden has been doing this a long time and their organization has some of the most passionate experts in the field. By working with them, it's going to cost us 10 cents per tree. When we first had this idea, the main reason we never really pursued it was because of how expensive we imagined it might be. The fact is, all you backers made your pledges to support a game's development, not the humanitarian aspirations of its developers. So the cost of this sort of thing was often the reason we kept nixing the idea. But at 10 cents a tree, we were more than willing to lose such a small sliver of revenue from each pledge. That 10 cents covers the transportation of seedlings (real seedlings, not you fine folk), planting them, and then weeding them later in the season. Each tree only costs us 10 cents. All existing backers will get a tree donated. All new backers will get a tree donated. 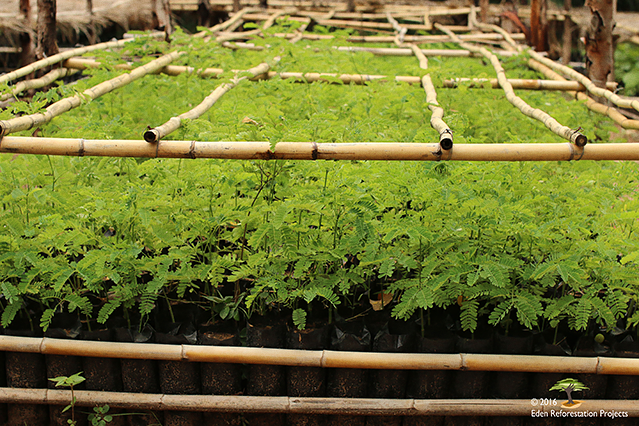 So far, that means over 4,300 trees are getting planted! Whether you're a Kickstarter backer or a Piggy Backer, you will get a tree planted on your behalf. Each and every new backer that Kynseed gets now and in the future, for the entire life of the crowdfunding campaign, will also get a tree planted on their behalf. As of a few days ago, our collective total of backers just hit the 4,300 mark. That means that all of you wonderful people have helped plant 4,300 trees so far. For a moment, try to imagine what that many trees looks like. Think about how crazy that is. For each of you that plants the kynseed acorn when playing for the first time, there will exist in the real world an actual tree that you've also helped plant. Have more questions about tree donations, like what kind of trees they are and where they'll get planted? Check out this short FAQ from further down in this thread. The next time you hear from us it will be because the Kynseed Closed Beta launched on April 29th! If you haven't already, feel free to read the full closed beta announcement we recently made. The closed beta is open to all backers and will be playable on Steam using a special closed beta key (which we'll send out when the time comes). If you backed prior to April 15th, you'll need to go to visit the closed beta opt-in page and get yourself opted in. If you backed on or after April 15th, you're already opted in and don't need to do anything but endure the wait until it launches. As always, thank you for supporting Kynseed and going on this amazing journey with us. We've heard that it's dangerous to go alone, so we're grateful to have each of you at our sides to keep us company and to share in our bad puns. We'll see you all again very soon. Last edited by Matt; October 28th, 2018 at 11:06pm. Can we name our trees? Because I totally want to name my tree. He will be Jurak. It is a good strong tree name. This is so awesome....I can't believe how happy this makes me. Wow.  I'm so proud to be a backer in more ways than one! Aww,are you sure it can't be changed? Anyway,this sounds amazing,makes me proud to be a backer of this game. I can say that I'm very proud to be one of many PixelCount's trees! Wow, this is a really great idea. So glad to help fund not only making your lovely game, but that it's also contributing to a great environmental effort. Woah, I'm speachless. Backed the game 2 days ago. Now I have a tree. This makes me berry happy about my decision. I like you guys, you care about the ripe stuff. This is just a really nice thing. Nice bit of news to read on my return home from work. I was just reading that email and even when I'm in a kind of hurry right now, I had to login and tell you how incredible awesome you guys are! Personally, I'm very fond of trees ,was planting several on my own already and just love it to see them grow bigger and bigger each year. And now I was planting a tree again, with your help and that's just super cool! Fun fact: squirrels plant thousands of trees per year because they often forget where they hide their nuts.